Should that be the veggie national dish of UK? Its really baffling that though mogo, cassava, tapioca, yuca does not grow in UK, every Indian restaurant will offer mogo as a starter. Be it chilli mogo, garlic mogo, garlic chilli mogo, chilli garlic mogo, dry or with gravy,fried. I still have to come across a popular Indian restaurant in UK not serving this dish. It seems it is a popular dish among the Indians. Everytime we go out for dinner as a family(huge one), mogo is always ordered. I tasted this dish for the first time in a popular Indian restaurant we had gone to years back. A few days ago, Esther my veggie lady as I call her, brought fresh mogo and insisted that I buy some (she grows them on her farm). I bought it not knowing what I will do with it. Suddenly, dinner idea came to my mind and I was going to fry it but then thought of garlic chilli mogo and my mouth started watering. None of the Indian restaurants serve that here so I had to make it on my own. Browsed on the internet for the ideal recipe but found that most of them added capsicum which I couldn’t add as hubby dear doesn’t like it. So just got the idea how it is made and adjusted the rest according to our taste. My hubby loved it and so I decided to write down the measurements so that next time when I make it, I don’t have to go through the trial and error session. Here is the recipe and please adjust the spices according to your taste. Peel, wash and cut the mogo into bite size pieces. Boil enough water in a saucepan. Add 1½ tsp salt to the water and the mogo pieces. Boil the mogo till just done. Make sure it doesn’t get overcooked. Drain out the water and let the mogo cool down for a while. Heat oil in a wok or kadai for frying over medium heat. Fry the mogo in batches till it is light pink in colour. Do not over fry otherwise it will become dry. Mix tomato puree, ketchup, soy sauce, chilli sauce, chilli powder and salt in a bowl. Add cumin seeds and then the onion. Stir fry the onion till it becomes soft and translucent. Add garlic and the chilli rings. Add the sauce mixture and mix quickly. Add the mogo pieces and pepper powder. Mix well. Garnish with fresh chopped coriander or spring onion and serve immediately. If you want to add capsicum or bell pepper, cut them into chunk sizes and stir fry with the onion. For a more spicy mogo add more chillis. Avoid adding chilli rings if serving it to kids. Leave mogo fried and ready to serve later. Great party snack. For more gravy or sauce double the amount of sauces. Delicious , I love casava a lot, I try this recipe. 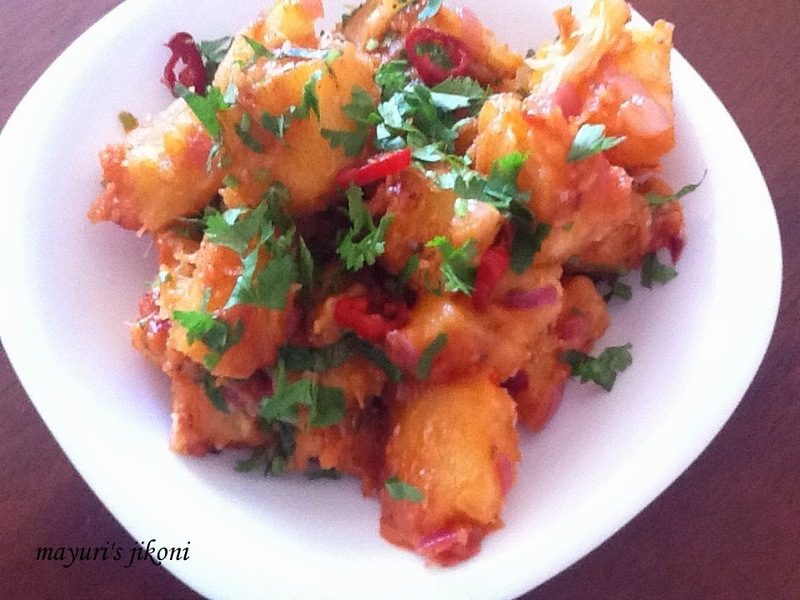 Hi Mayuri bhabhi thanks for sharing this amazing recipe Nerali gave it a try for the little ones first birthday last year and it was a huge hit since then she make it regularly. Thank you so much for trying out my recipes.